Beneath the snow, my garden lies waiting for the rebirth of spring. For months, there have been no visible signs of growth – no change, no movement, no life. Frigid and cold, the world outside my window appears locked in a state of suspended animation. 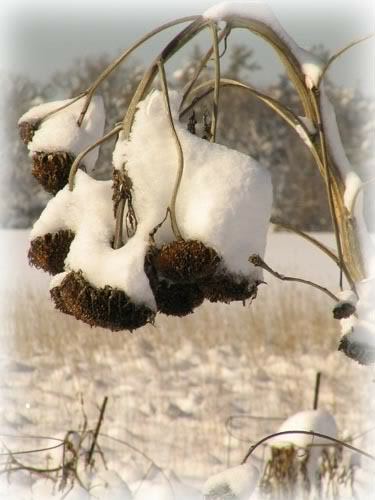 The sunflowers stoop low under heavy caps of crystallized snow. The bean trellises and toppled tomato cages take on magical forms as the flakes stack quietly, softening the rigid contours. The rest of the landscape is indiscernible. Boundaries between hedgerow and field have merged under an insulating blanket of white. From one storm to the next, the snow drifts deeper, accumulating, stretching far to the horizon. Just as winter has gripped the landscape, I, too, have been gripped by life’s circumstances. In the call of duty, boundaries once clearly defined have become indistinct. My joy is gone, my cup half-empty. Hopelessness stretches far out before me. I fight the day-to-day sameness – despair over God ordained limitations. I cannot change my life’s circumstances any more than I can tell the southerly breeze to blow and melt the winter’s snow. But unlike my garden, I resist every effort to be still, to wait upon the Lord to provide what my thirsty soul longs for. How long, oh, Lord, how long? How long will I have to endure this season Thou hast ordained for me? To everything there is a season, but this season is particularly long. Will spring ever come? Will hope ever spring eternal? Spring and autumn pass quickly, summer lingers, but winter is longer and harder to endure. Let endurance have its perfect result. There are two Greek words for the word endurance. The first is prosdechomai, pros-dekh’-om-ahee which means to await (with confidence or patience): accept, allow, look (wait). The other is hupomone hoop-om-on-ay’ which means cheerful (or hopeful) endurance, constancy: – enduring, patience, patient continuance (waiting). In order to find joy, I have to let endurance have its perfect result. I have to be still. And finally when I allow my soul to be laid bare and stripped of its defenses – its busyness, its escapes, its pleasures, finally when I cease to strive, the words of comfort come in the truth of the familiar hymn, given by a loving heavenly Father who knows, who cares about the minutest details of our lives. Even when it appears there are no solutions, in the stillness He speaks. And through the hymn writer, He reminds me to bear patiently my cross of grief and pain. Wanting so desperately to escape my circumstances, I fail to acknowledge all the grace-filled moments that exist within them. Some spiritual seasons are longer than others.There must be a time of inactivity to experience growth. There must be time of near death, for life to teem again. I embrace the lessons my garden gifts me even in the dead of winter. I choose to lie hidden in my Maker, awaiting rebirth – my heart dead to its own will, slumbering through a long cold winter of the soul. Grace is here, waiting to be received. Take comfort my soul; the Lord is on thy side.